A senior member of the Kenyan government who was banned from entering the United Kingdom is challenging the decision in the High Court in London. 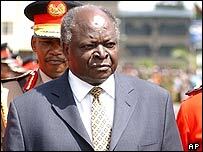 Dr Chris Murungaru, Kenya's transport minister and a close ally of President Mwai Kibaki, has begun proceedings to get the decision judicially reviewed. His visa was revoked but the British authorities did not disclose the basis for the decision. The minister's lawyers argue this is a violation of his human rights. Dr Murungaru had been making frequent visits to Britain for private medical treatment, following surgery in April this year. But on 25 July he received a letter from the British authorities informing him that his visa was being revoked. It gave little explanation other than to say that his presence "would not be conducive to the public good" in the light of his "character, conduct and associations". His lawyers now want that decision judicially reviewed by the High Court in London. They argue that Dr Murungaru should be offered an opportunity to address any concerns the British government has, and that because he was undergoing a course of medical treatment, suspending his right to enter Britain was a breach of his human rights. His lawyers argue that it has damaged his personal and political reputation, and that the letter's timing - so soon after the London bombings in July - implies that he could be a security threat. But there are strong suspicions that the ban is linked to Kenya's record on tackling corruption. It is no secret that Dr Murungaru has had a series of very public disputes with the former British High Commissioner in Kenya, Sir Edward Clay. 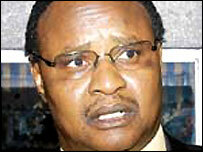 He has been critical of the Kenyan government's record on tackling corruption. But it is far from clear whether this personal animosity has played a part in the visa ban. The British government now has 21 days to respond to the Kenyan minister's legal challenge.